The company says its use of blockchain will create a single source of truth that will enable greater auditability, traceability, and trust that will encourage creation of innovative services. 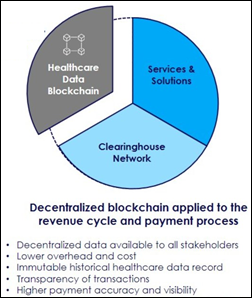 Change Healthcare’s Intelligent Healthcare Network processes 50 million claims-related events each day using blockchain, which the company says is a successful demonstration of its capability in high-volume transaction processing. From Bama Boyz: “Re: Practice Fusion. Revenue of only around $60 million, tried to sell at 4-5 times revenue with no takers, and Allscripts has been trying to build a low-end cloud product that is going nowhere two years in. Allscripts needs a cloud product, Practice Fusion’s investors are tired, and thus the deal makes sense even with no winners.” Unverified, although it’s interesting if a company that offers a free, no-maintenance EHR is making $60 million selling patient data and drug company EHR ads. I observed on November 1 that the previously high-flying Practice Fusion had fallen off everyone’s radar with modest at best EP attestation numbers, especially for a product that’s free and has been around for more than 10 years. The $100 million cash acquisition price doesn’t even cover the $157 million that VCs unwisely fed it. Allscripts adds yet another ambulatory EHR to its fleet, increases market share by buying a questionably quantified customer base that isn’t paying anything, and drops another discounted day-old pastry into its mixed bag of unrelated acquisitions. On the plus side, it gets a market-tested cloud offering for small practices that can be quickly retooled into a licensed product instead of an ad-supported freebie. I don’t know what happened to the somewhat secretive Care Otter/Allscripts development team that was supposed to demo its new EHR at MGMA but didn’t. The challenges for Allscripts will be to figure out how to sell the Practice Fusion product to those small practices (Practice Fusion required only filling out a short registration page) and keeping cross-selling expectations realistic. I’ll also note that MDRX shares are up 44 percent in the past year vs. the Nasdaq’s 30 percent, so the market likes what Allscripts is doing. Philips is engaged in increasing efficiencies in its Population Health Management business to meet evolving customer strategic goals, challenges, and needs with agility and focus. The Population Health Management market is a very promising, yet highly dynamic growth market. After careful consideration, Philips undertook a very limited restructuring of specific positions in a number of functions in December 2017, with those positions being eliminated in January 2018. Employees affected by this limited restructuring will be provided with a comprehensive separation package and transition support. Welcome to new HIStalk Platinum Sponsor QuadraMed, Healthcare Identity Experts. The Plano, TX-based company provides award-winning end-to-end healthcare identity management solutions that include enterprise master patient index software, MPI clean-up services, EMPI analytics, and staffing. It can diagnose, treat, cure, and prevent identity issues with 99 percent accuracy. The typical hospital’s 8-12 percent duplication rate – which gets a lot worse after a merger or acquisition — places patients at risk for medical errors, impedes interoperability efforts, hampers ACO operations, and jeopardizes EHR conversions. Simple EHR vendor matching algorithms use a handful of identifiers that require an exact or phonetic match, yielding only 50 percent accuracy and a lot of false matches. 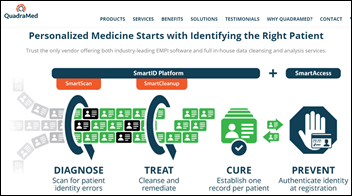 QuadraMed’s probabilistic algorithm analyzes many patient demographic data points and tunes out data entry errors to deliver 99 percent accuracy. Customer Newark Beth Israel Medical Center (NJ) reports that it dropped its duplicate record rate from 11.1 percent to 0.2 percent, improving its registrar workflow as well as patient safety. Thanks to QuadraMed, Healthcare Identity Experts for supporting HIStalk. I’m looking for a health system CIO or IT director who can become a regular HIStalk contributor Dr. Jayne style. I can also use a nurse in a CNIO or other informatics role as a second contributor. Reader survey respondents suggested I add these additional voices and I agree, although I’ve tried before with minimal success — I need expertise, good writing skills, and a commitment to sticking to a schedule. If you’re the CIO/CNIO equivalent of Dr. Jayne, contact me, but don’t be surprised when I ask you to write a sample post – several people have been gung ho until faced with the pressure of that first empty page, causing their sudden disappearance. Siemens will take its Healthineers business public in an April IPO that will value the company at $48 billion, Reuters reports. Eric Topol notes that healthcare has for the first time become the #1 source of American jobs, passing the retail sector. The federal government predicts that five of the seven fastest-growing industries over the next 10 years will be in healthcare. Topol concludes, “Human resources are the #1 driver of the $3.4 trillion healthcare expenditures/year; the job growth is unchecked. 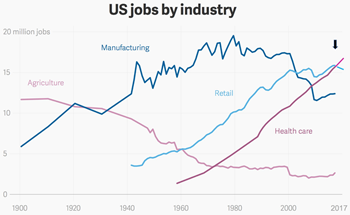 We watched an industry with nearly six decades of unbridled growth, with poor outcomes relative to the rest of the world, and did so little to alter the course.” I suspect the vast majority of those newly created jobs will not involve actually delivering care. 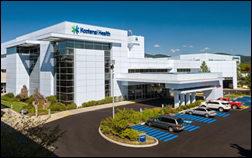 Kootenai Health (ID) selects the legacy data archiving solution of Parallon Technology Solutions to allow it to view extracted, self-hosted Meditech Magic data via a viewer. 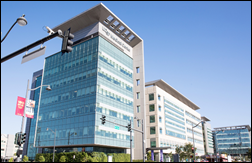 UCSF Medical Center (CA) will implement IV safety analytics from Bainbridge Health, a spinoff of Children’s Hospital of Philadelphia. In Canada, Peterborough Regional Health Centre expands its integration relationship with Summit Healthcare to include additional care coordination connectivity and integration with Connecting Ontario. Video visit vendor MDLive hires Rich Berner (Allscripts) as CEO. USPTO awards Glytec another patent, this time for personalized, computer-guided selection and dosing of any oral or injectable diabetes regimen. I think some of those trust concerns are used as a red herring to try to limit the sharing of data for competitive purposes. We’ve seen this with HIPAA, where we’ve been told ‘we can’t give that to you because of HIPAA.’ That’s totally misinterpreting HIPAA and these trust issues become a scapegoat for not wanting to share data for competitive reasons. 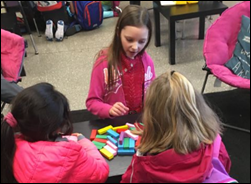 Trying to figure out where that is happening versus real issues with sharing health information is part of the job that we take on. 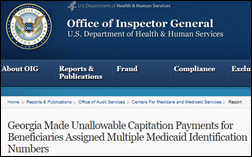 HHS OIG says Georgia Medicaid made a lot of unallowable payments because the several systems it uses to assign ID numbers can’t detect duplicates. A Tufts analysis finds that the growing volume of data collected in clinical drug trials is increasing drug development time and adding integration challenges since most drug companies and research organizations still don’t collect EHR data electronically. Casenet releases version 6.4 of its TruCare care management platform. Kyruus will offer its ProviderMatch patient access solutions on Epic’s App Orchard for seamless patient scheduling. Boston-based startup news site VentureFizz interviews ZappRx founder and CEO Zoë Barry. OpGen and Merck subsidiary ILUM Health Solutions will collaborate in a CDC-funded project to develop cloud- and mobile-base antimicrobial stewardship software for hospitals in Colombia that will support WHO’s WHONET global drug resistance monitoring software. Iatric Systems will integrate HealthGrid and Meditech solutions to help Ephraim McDowell Health (KY) with value-based care initiatives. PerfectServe will integrate its clinical communication and care team collaboration platform with Microsoft Skype for Business to allow clinicians to conduct video conversations from within the PerfectServe application. Meditech will integrate aggregated data from Arcadia Healthcare Solutions into its Web EHR and analytics product for population health management. Besler renews its HFMA Peer Review designation. Netsmart will embed the virtual doctor service of American Well in long-term care and behavioral health EHR, giving patients improved access to professionals and allowing them to obtain services from home. Culbert Healthcare Solutions will exhibit at the HFMA Revenue Cycle Conference January 18-19 in Foxborough, MA. Dimensional Insight will exhibit at the MUSE Executive Institute January 14-16 in Newport, CA. KLAS recognizes Aprima as a top-tier vendor of ambulatory RCM services for the large and small clinic categories. Iatric Systems will exhibit at the MUSE Executive Institute January 14-16 in Newport Coast, CA. InstaMed will exhibit at the HFMA Western Region Symposium January 14-17 in Las Vegas. You mentioned Siemens Healthineers. You know what you have to do next! Can confirm – this killed all productivity at our newly-christened Healthineers office today. It was hard to get any work done in between the fits of laughter and moments of dumbfounded shock that anyone, anywhere, thought this was going to be a step in the right direction. Siemens made ovens at Auschwitz. I think they will regret this more. Siemens: we’ll lay off 12,000 employees to keep profits up. Now show us how much you love your job! 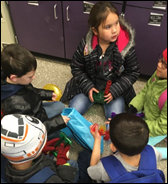 Dance, puppets, dance! This event was probably a huge success. Nothing brings people together quite like hating something together. When the camera pans across the crowd … wow. It’s like a bunch of KISS fans who accidentally showed up at a gospel festival, or vice-versa. After this presentation, Hermann von Siemens was exhumed and charged with war crimes for a second time. The balding, middle-aged engineers in the audience seem to be as horrified and bewildered as we are, so we can at least have some faith that the people who do the actual work at Siemens have their s&^% together despite upper management’s cluelessness. I was waiting for one of the blue morph suit guys to tear their mask off, revealing a Michael Scott glowing with so much pride it hurt to look at. It really pains me to know that this is what our healthcare dollars are being spent on. I think the world is finally getting over giggling at the pronunciation of our company’s name. We need to up the ante with something else embarrassing. This is great marketing material … for GE and Phillips. How can a company be taken seriously if they are so out of touch to think this was a good idea? I feel like there must be some elderly Germans left around who would be more than willing to tell you that this is, in fact, a very clear sign of things about to go very, very wrong. It is cringingly awesome how they have the lyrics highlighted as if they thought everyone would want to sing along. Suffering through that pap is one thing, but having to tell people who ask that you work for Siemens Healthineers? That’s torture.